I believe the reality of an atmosphere has been pointed out in recent re-apprailals of the habitability of planets orbiting red dwarfs that are likely to be tidally locked facing their star. Curiously the standard argument also maintains that lacking a magnetic field strips away the atmosphere yet here Venus is with a remarkable one. As for the vortex of Venus itself it gives the impression one is looking down through a transparent column of Venusian atmosphere to where the clouds lay around the border or wall and it gets brighter as you go down. Is that an accurate understanding or is it an illusion? Could the brightness be “daylight” nearer the surface ( I presume we’ve never actually seen down to the surface if this is really funnel shaped vertically speaking.) Hmm – that would be interesting to see from the side and if it reaches the ground in some form. 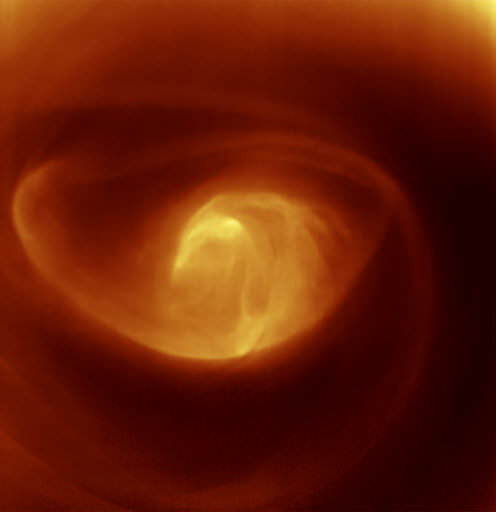 “Venus is partially protected by an induced magnetic field. During the continuous battle with the solar wind, this region of the upper atmosphere is able to slow and divert the flow of particles around the planet, creating a magnetosphere, shaped rather like a comet’s tail, on the lee side of the planet”. I did see on the NASA site that it was an infrared image. Missed that here. I still wonder if the vortex ever clears down to the surface enough to make it more specifically visible. The eye of the hurricane as it were. About the magnetic field – that is the thinking the differentiates Venus from Mars? Mars is so far away that it could be lacking the ability to generate an ionization level substantial enough to turn aside the solar wind’s erosion? I wish we’d hear more about this idea in the various papers and news reports. It certainly would be salient in the discussion of habitable planets.